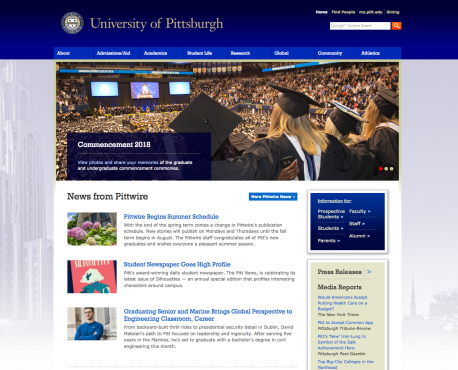 The University Communications Web Team is responsible for Pitt’s Institutional presence on the World Wide Web. We have built — and continue to maintain — a number of sites for offices, special initiatives, programs, and services with University-wide impact. 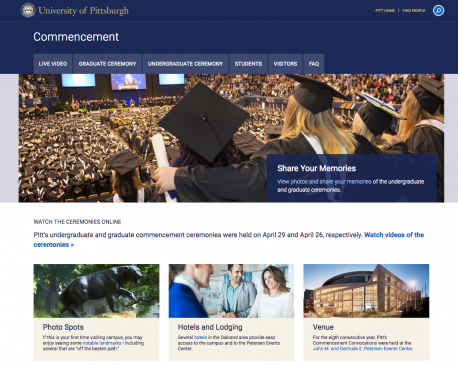 This online hub for information about Pitt’s graduate and undergraduate commencement ceremonies also features photo galleries of graduates and their families plus live-streaming videos of the ceremonies. 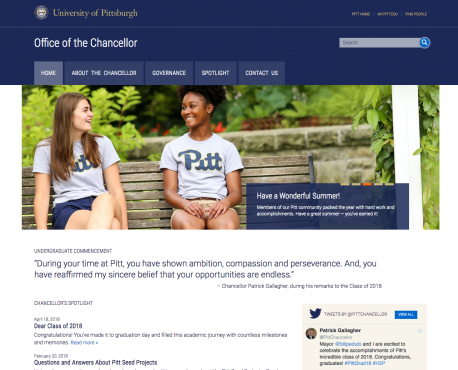 This site posts statements, Tweets, and other communications from Chancellor Patrick Gallagher as well as information on his leadership team and office staff, Pitt governance, awards, and more. A “Contact Us” page enables visitors to submit invitations, requests, and comments. 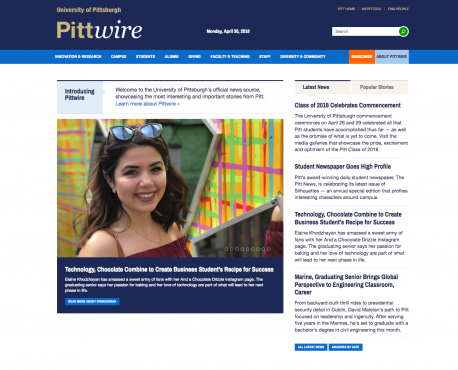 Pittwire is the University’s official news service, highlighting stories about Pitt that are of broad public interest. News stories are organized into categories — innovation and research, campus, students, alumni, giving, faculty and teaching, staff, and diversity and community — that align with Pitt’s key stakeholders and its strategic goals. One of the larger and more complex sites created by University Communications, this site serves as the provost’s chief online communications forum. It features sections for faculty, students, research, University planning and office initiatives, and includes hundreds of pages of policies and guidelines. Each academic year since 2014-15, the Office of the Provost has declared a special area to highlight through campus events and activities — with 2018-19 The Year of PittGlobal. University Communications has created a site for each year, featuring news and events updates and online forms for submitting funding proposals. 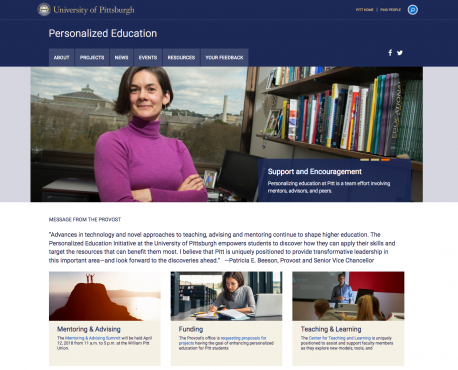 The Web site for Pitt’s Personalized Education Initiative features initiative details, projects funded through the initiative, personalized education resources at Pitt, a video, and online forms for submitting grants and for providing feedback and input on the initiative. 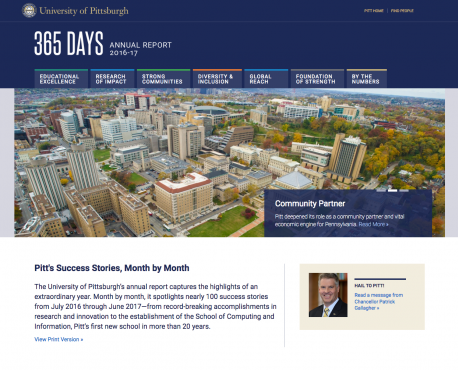 In a month-by-month format, the Annual Report spotlights 100 Pitt success stories in academics, research, community building, diversity and inclusion, and global reach, while also including traditional annual report data. The University events calendar, Pitt's first institution-wide calendar, is populated with hundreds of events by contributors from around the University. 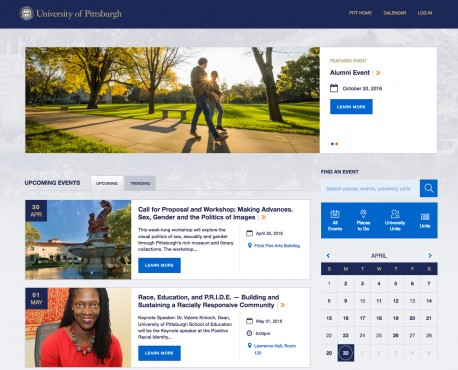 The calendar is featured on Pitt.edu, and events may also be accessed through individual unit sites, Pittwire, the University Times, social media, and many other channels. With photos, links, and map locations for than 200 Pittsburgh campus facilities (including landmarks as well as lesser-known treasures), the campus tour includes a general tour plus tours focusing on research labs, residence halls, the Cathedral of Learning, and sustainability. It also includes a basic campus map. A new iteration of the tour with interactive maps is anticipated to launch in 2019. 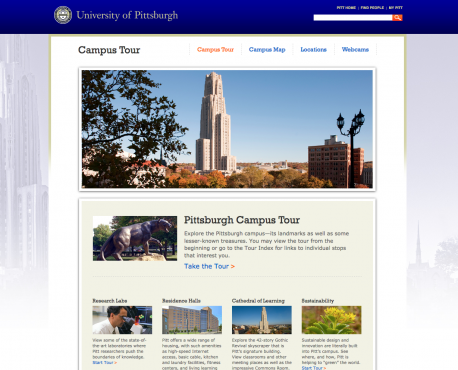 University Communications, in collaboration with the Office of the Provost, and advised by a University-wide advisory committee, produced the current iteration of the institutional site at www.pitt.edu in 2012. With a relatively small number of pages, the site connects visitors to the more than 350 academic and administrative unit sites. 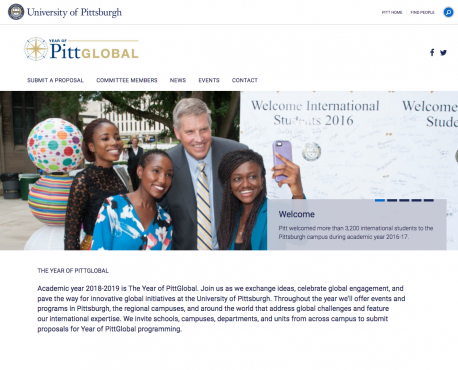 The next iteration of the pitt.edu gateway is anticipated to launch in 2019. 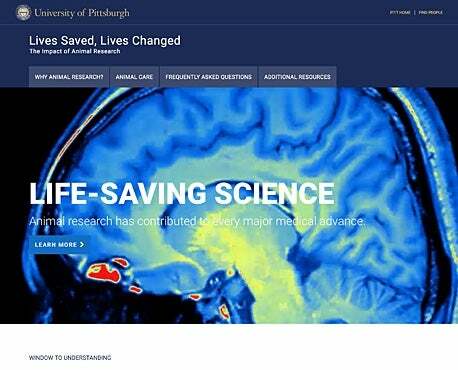 As its title indicates, the Lives Saved, Lives Changed site details how animal research has led to medical advances in the treatment of cancer, Alzheimer’s, and other illnesses. The site also describes Pitt’s high standards of care for research animals. 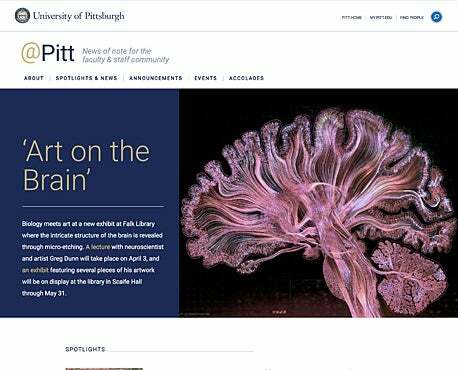 @Pitt is a new digital communication created expressly for Pitt faculty and staff members. 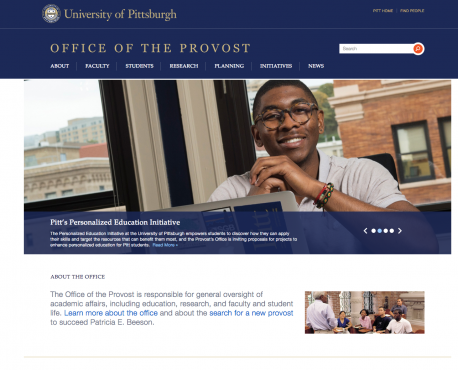 @Pitt complements the existing publications that faculty and staff already receive and focuses on institutional and administrative content, plus practical news-you-can-use for an internal professional community. 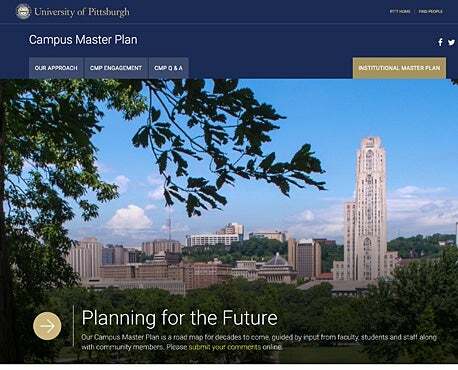 As the online hub for Pitt’s master planning process, the Campus Master Plan site enables visitors to review the draft plan, submit feedback on planning proposals, and find information and news reports about the process. The site also describes Pitt’s approach to campus planning and includes a Q&A about the process. 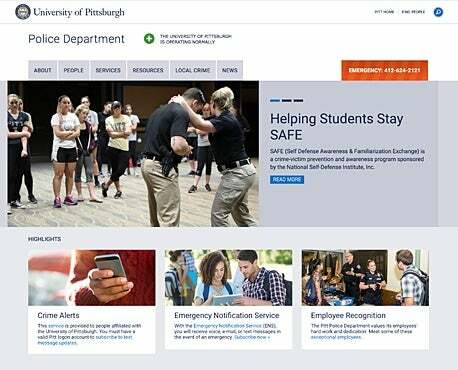 Our team added content management functionality that will simultaneously update the campus alert status on emergency.pitt.edu and on police.pitt.edu. We also improved the presentation and workflow for posting ongoing emergency updates on the site.